Happy Belated Valentine’s Day! 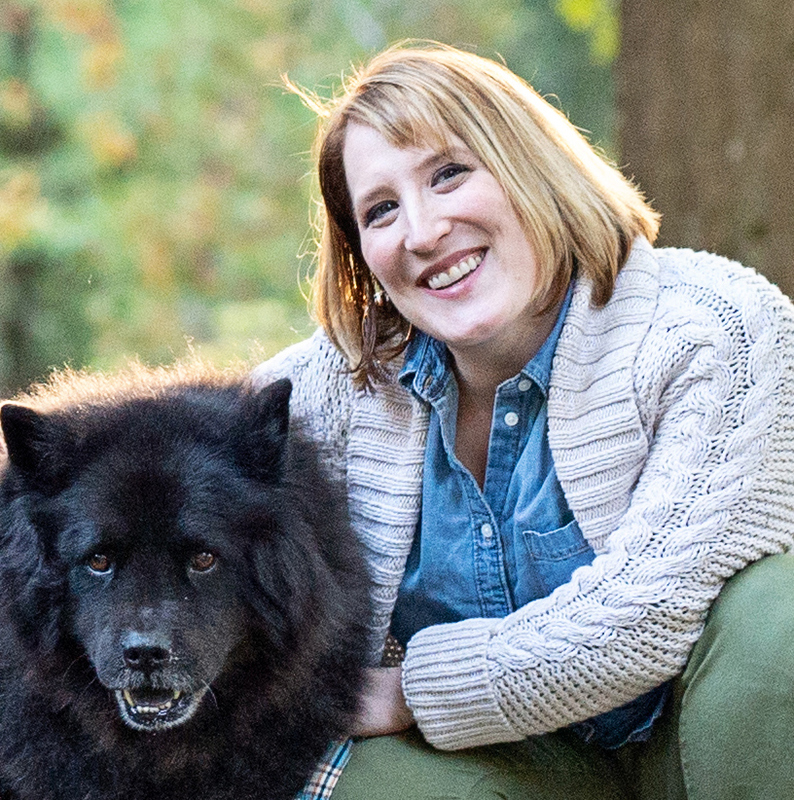 This post is a day later than I’d intended but I spent yesterday getting a steroid shot in my hip (and yes, I am only 34!). All I have to say about that is OUCH! And, no, not a fun way to spend the day. So, as a result this post is a day late and most of the cards I am about to share with you are still sitting by the front door awaiting a mail drop. But, it’s the thought that counts, right? As I mentioned in last week’s post, take it or leave it, I love Valentine’s Day. I think it’s a great excuse to remind people you care about them and of course yet another time to break out the card-making supplies. 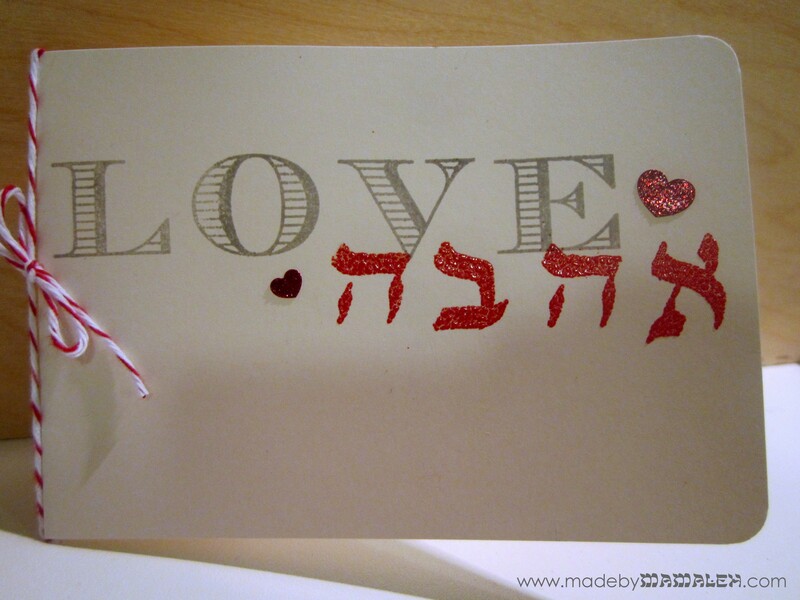 Kveller had a fantastic piece yesterday: Should Jews Celebrate Valentine’s Day?. If you want more intellectual food for thought, check it out. 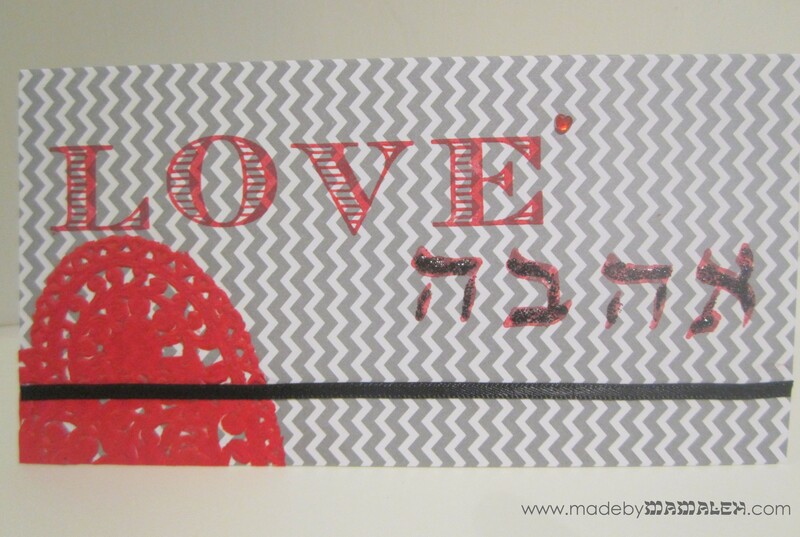 Today I wanted to share with you my attempt at adding a Jewish twist in this year’s homemade Valentine’s cards by incorporating some Hebrew. 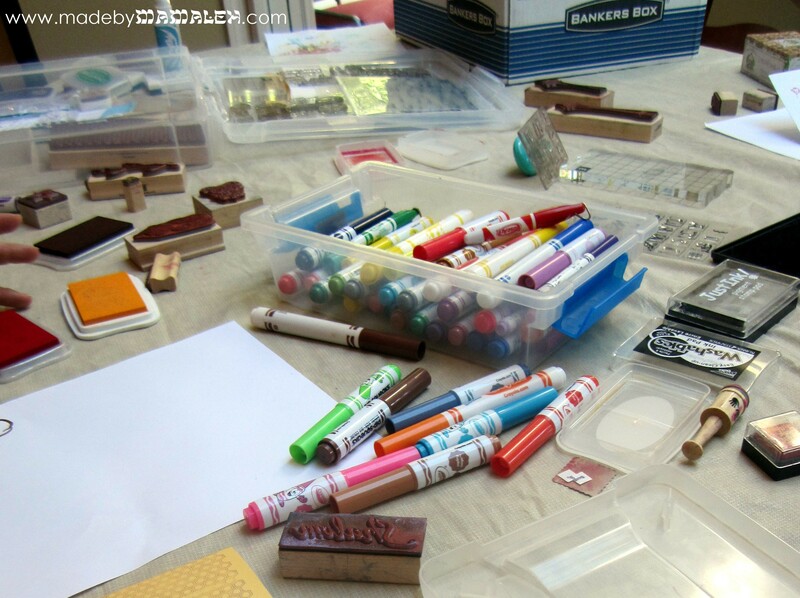 Now, I have to tell you, I LOVE alphabet stamps! I have too many sets to admit in writing. 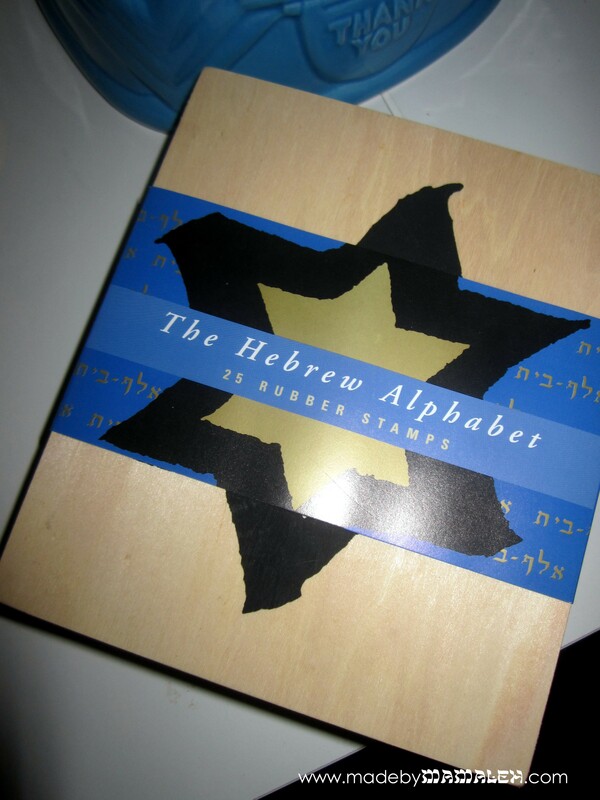 But, Hebrew alphabets are a totally different story than English ones and nearly impossible to find in rubber stamp form. So, I have been on the hunt for quite a while and was very pleased to luck out and get this now out of production set still shrink wrapped on eBay complete with book and packaged in a wood box. What do you think? 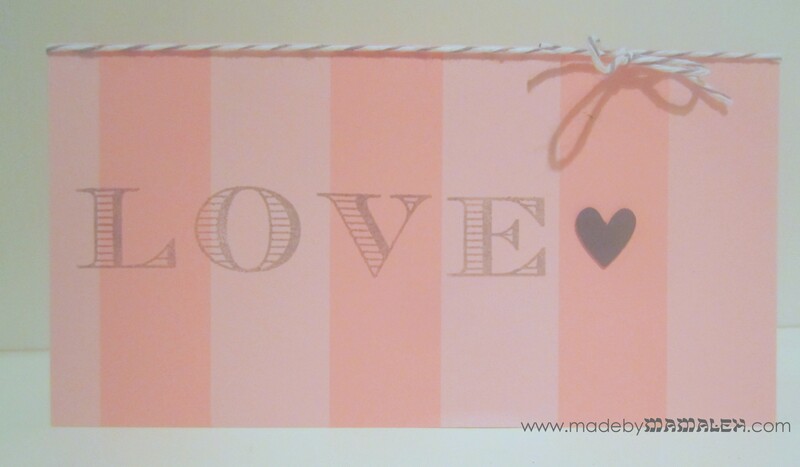 I totally love that these could really be used for any occasion where you want to say I love you! Now I need to start thinking about Purim projects…oy! I cut a tall skinny size card that is one of my favorites at the moment (3 1/4″ by 6 1/4″) out of Bazzil cardstock (can’t remember the name, sorry). 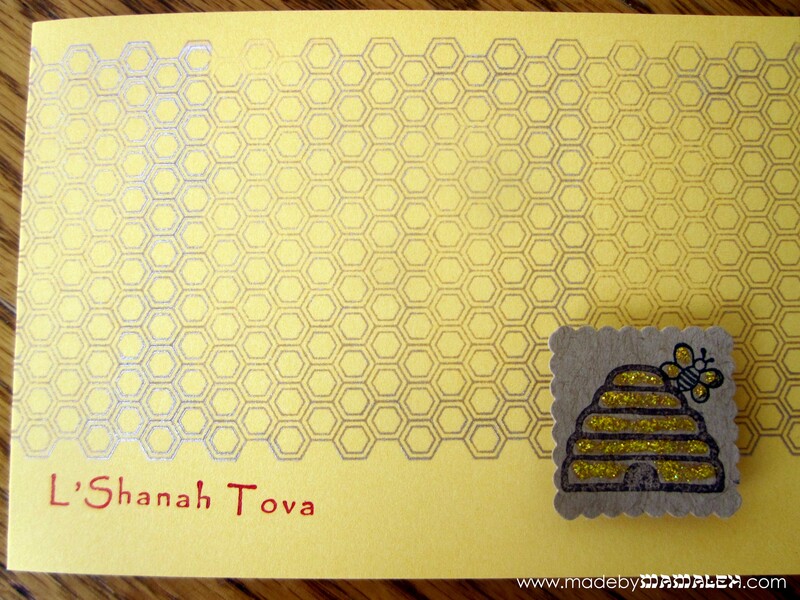 Then I stamped some Stars of David (this one is from a Jewish stamp set I bought forever ago) using VersaMagic CloudWhite. 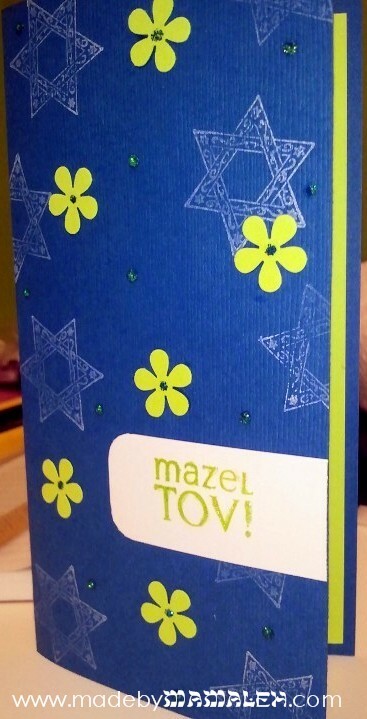 Next I punched some lime green flowers which I glued on and accented with True Blue Stickles. 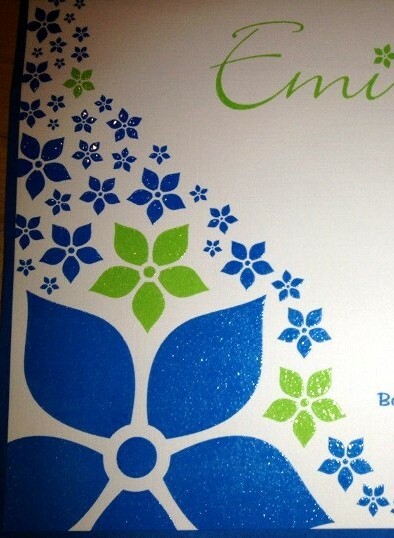 Then I cut and rounded a piece of white cardstock and stamped Mazel Tov from PTI in Grass by Fresh Ink and then gave it a little Firefly Stickles accent. Finally I lined the inside with more of the lime green cardstock and then paired it with one of my skinny Impress envelopes. Sorry it’s not the best pic – photographing cards is so tricky and I am still getting the hang of it especially now that sunshine has left us but hopefully you can get a sense of it. You know how folks typically get half-way through January guilt-ridden with having failed to send holiday cards? Well , that’s me this month of Tishrei. But, just like the fact you pretty much have all of January to say Happy New Year, the same goes for Tishrei and the entire period of time between Rosh Hashanah and Simchat Torah (and then some). 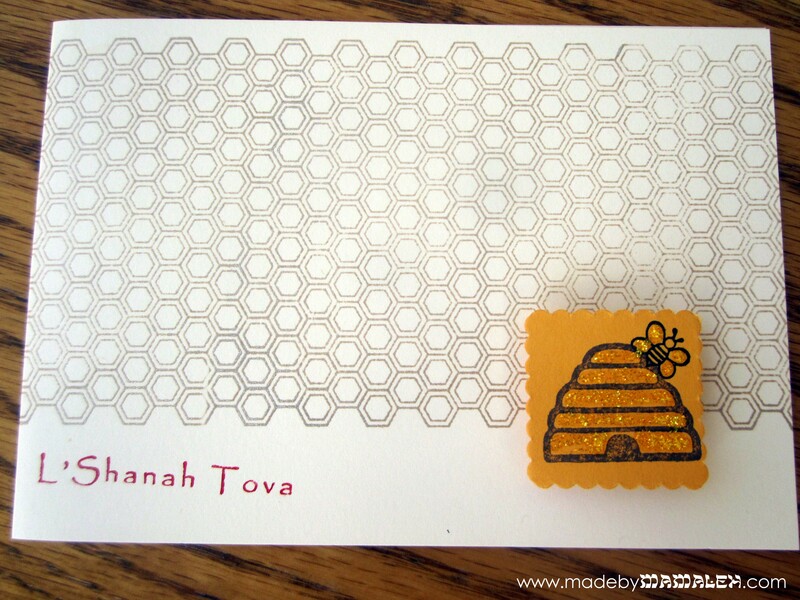 For my grown-up cards, I went with a honey theme and simple design with a little depth thanks to pop-up foam squares. With any luck, I’ll actually get them in the mail this weekend. 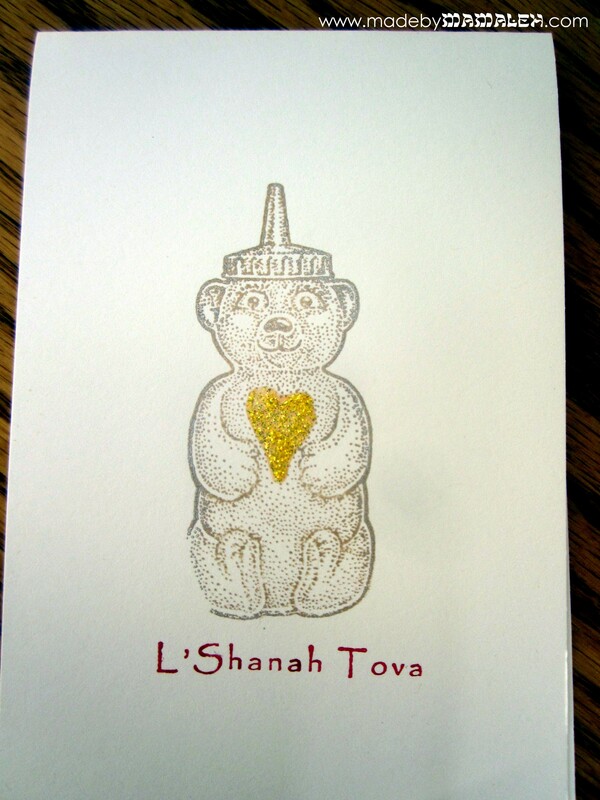 Did you make or send new year cards this year? Before I go, I just have to share with you Maggie’s brilliant idea for one of her cards. 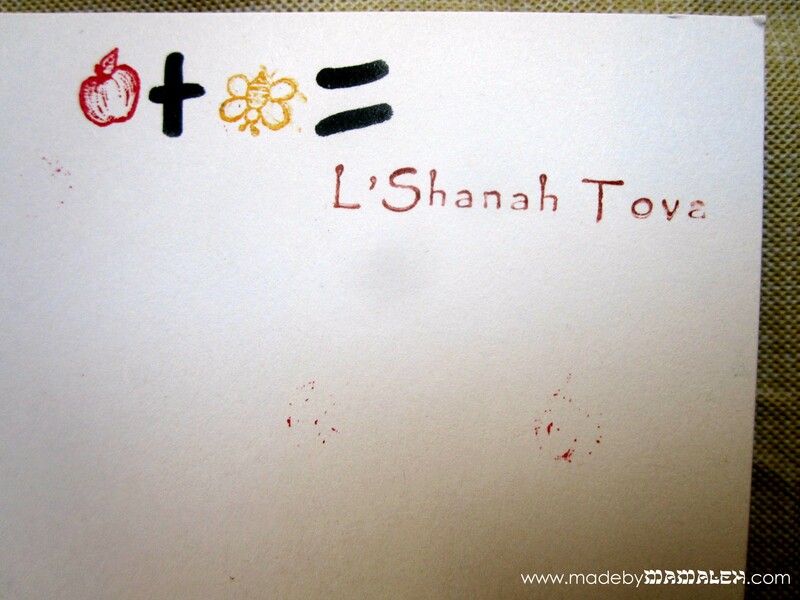 Shanah Tova! 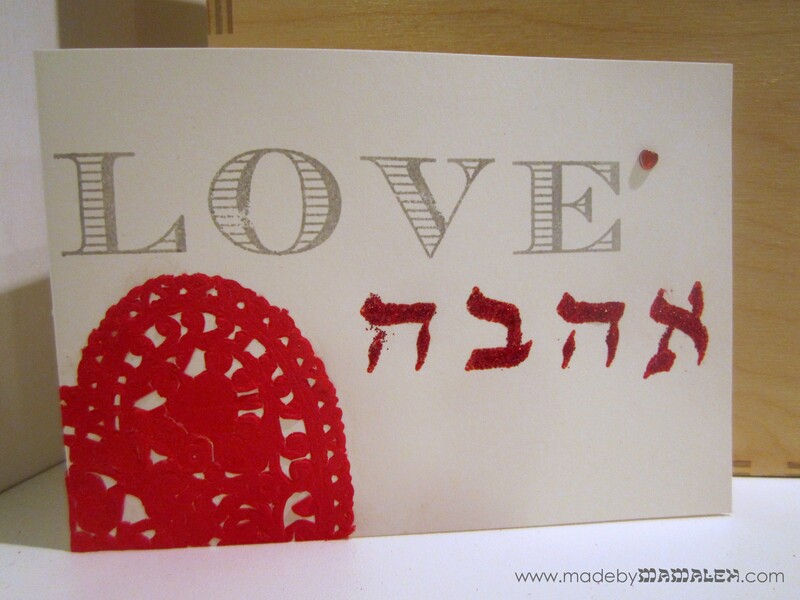 And, Happy World Card Making Day (today)! 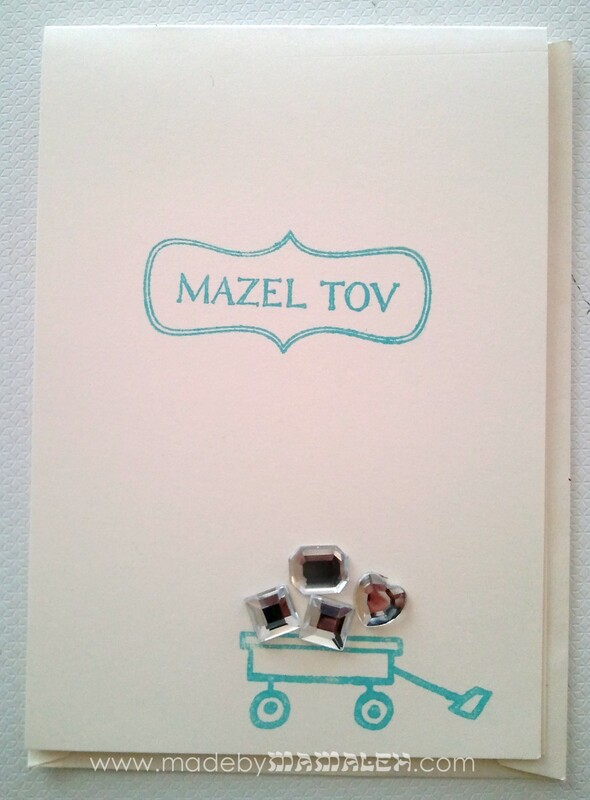 In honor of my friends Jen and Paul, who’s son was born yesterday, here is a simple fun little baby card wishing them lots of mazel (luck).